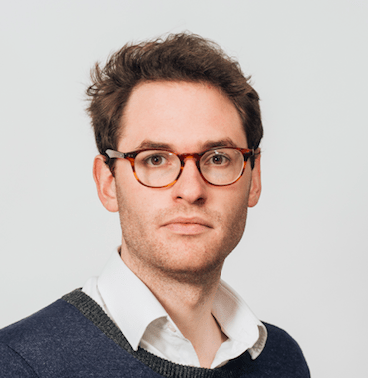 Allen & Overy’s Fuse incubator for legal tech companies has understandably seen a number of….well, legal tech startups and more developed companies joining the group. But, in the second cohort that started in May one of the companies is Signal Media, an NLP-driven news and information research platform that keeps you appraised of everything happening in the world, and in 80-plus languages. 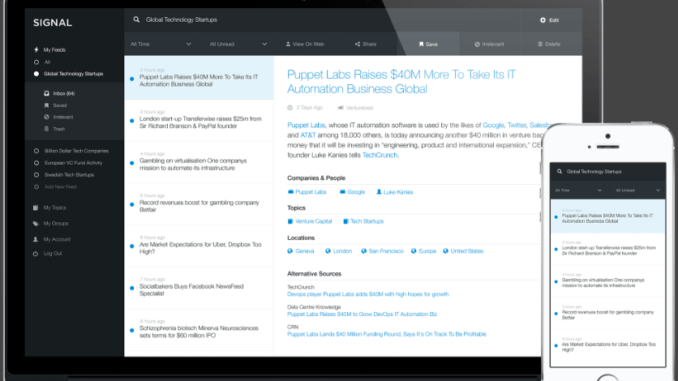 It’s arguable – and Artificial Lawyer has seen it in action – that it’s better than Google News. The central idea is that users – who pay for the service – will be better informed of what is happening and able to more accurately follow emerging trends in the world, whichever sector or topic you want to focus on, so that you can make better decisions. Or one could say: better informed, better outcomes. Its NLP approach seeks to find you the information you want by measuring the distance between key words, so as to provide a more semantic and ‘common sense’ result, rather than a huge list of anything that has the key words you are looking for. Just say no to Boolean. The company has also just secured a huge wad of funding, and now has some very significant backers. It has raised $16m (£12m) in a Series B round. The funding round was led by GMG Ventures LP, the independent VC fund whose limited partner is The Scott Trust, owner of The Guardian. MMC Ventures was the largest investor in the round, which included a debt facility from Kreos Capital. Other investors include Frontline, Hearst Ventures, Reed Elsevier Ventures and LocalGlobe. Let’s just read that again: a VC fund connected to the Guardian newspaper; Hearst Ventures – of Hearst media fame, which also has investments in Vice and Buzzfeed, not to mention a host of newspapers; and global information provider Reed Elsevier. Impressive, especially if you are a startup focused on the media. Artificial Lawyer caught up with head of strategy, Felix Danczak, to learn some more. Danczak starts by saying that Signal currently accesses 2.8m sources, including 2.6m online; 100,000 print; 2,500 broadcast and radio; and around 200 regulators. To explain, Danczak tells the startup story. The founder, David Benigson, became aware about eight years ago of just how hard it is for businesses, especially larger, more complex and global ones, to stay on top of all the issues that are constantly emerging, from news about a rival that may be about to go bankrupt, to a new proposed regulation in China that looks likely to become law next week, but where the announcement has been buried in an obscure Mandarin website read by almost no-one. In a world of data how do you make it work for you? Rather than just drown in it? Benigson talked to around 30 CEOs about this and they all said they found trawling to discover useful, business critical information to be very hard. Just using Google didn’t work. They knew they were missing key bits of information. They were missing the signal amid all the noise. And, so too, were the big law firms. Law firms also need to keep up to speed with sometimes very rapidly changing situations. E.g. a financial crisis that might be impacting decisions in a foreign country’s new bond issue. How do you keep across all potential and related information? Google ‘bond issue’ and ‘Malaysia’, for example, and you’ll get just under 14 million returns. Do that at a time of a real financial crisis and the number could double, maybe quadruple. Missing things becomes increasingly likely, especially when time is limited to make an assessment or inform a client of what is best to do. Many major law firms (see graphic below), including Allen & Overy, are just the kind of advisors that face the need to advise clients on events that are moving very quickly, often on a global scale. In which case being 100% on top of the relevant news matters. And being able to find what is relevant is the key here. Information is easy to come by. Actionable intelligence is something else. So too is the reassurance you likely have not missed anything that matters to you. Signal reaches out to everything, including blogs – such as Artificial Lawyer – around the planet, using Yandex to translate from 80 different languages. 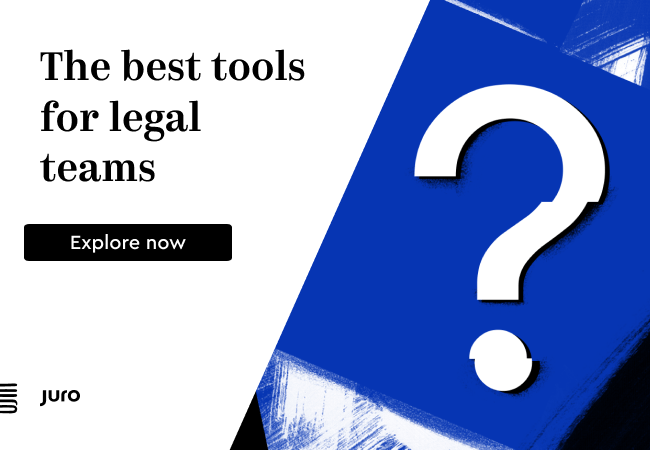 It tracks what you want to find, and also extracts the passages of importance – a bit like legal research systems do with case law. Some of Signal’s customers appearing on the website. One potential area for the company to develop is a better means of showing in which direction a certain subject matter is moving, one might say its ‘vector’. This builds on the established data-led process of sentiment analysis in media content, though Danczak says that basic numerical sentiment scores are not that helpful. The company’s aim is to show how the sentiment changes over time. In short, to get ‘a steer’ from the direction of the news. They are currently developing a means of doing this. One approach would be to strip out nouns and look at things like adjectives and how often they occur, Danczak says. This could help to hone in on the mood in a more objective fashion. I.e. it’s not the adjectives themselves that matter, but the number of times they appear over a period of time, thereby showing you how the mood is changing. In short, it’s keeping to the facts. Danczak adds that at this stage they have some working prototypes but the capability is not yet in the system. Artificial Lawyer and Danczak then end up in a theoretical discussion about where all of this data analysis can go. And it seems limitless. What happens if you cross reference GlassDoor (the recruitment site) reviews of companies with other news? And then add Google Maps reviews? And Amazon reviews? And all the other travel and leisure sites? What if you then add in stock prices and other financial indices? Social media feeds? Other data that can be scraped – safely, of course – perhaps public feeds on air transport, weather, road congestion feeds….? Ultimately it becomes a sort of nervous system for a large business that tells it what is happening in the world it occupies a place within. If you are an SME this may not seem too pressing, the world is outside your door. But if you are a big four firm, such as Deloitte, which it works with, and have offices in dozens of countries, then this starts to make more sense. For media companies this will also be a major benefit, so too for advertising and press agencies….and of course, governments. After all which government doesn’t want to keep its finger on the pulse of the nation – and not just depend on the BBC and main news channels to really see what’s happening? So, to sum up. Maybe Artificial Lawyer is super excited by this one because it is also a media business. 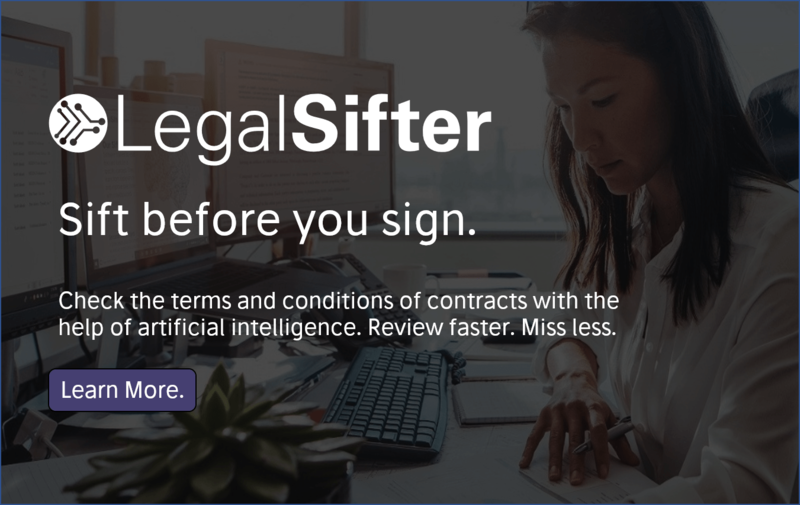 But, there really does seem to be a significant use case for this tech by law firms, especially those who advise on fast-moving, strategic business issues. Good luck to them and looking forward to seeing how this evolves.